Posted on Wed, Jan 23, 2013 : 6:19 a.m.
“All in the Family: Improvisational Architecture of Beverly Buchanan” is a gem of an exhibit whose secret resides in the notion of relative improvisation. Not everything here—at the University of Michigan Department of AfroAmerican and African Studies’ GalleryDAAS—is as it seems. In short, one of Ann Arbor’s greatest and best contributions to the contemporary visual arts scene: Buchanan keeps her art close to the proverbial bone. Buchanan has earned a 1980 John Simon Guggenheim Foundation Fellowship and National Endowment for the Arts Fellowship; a 1990 Pollack-Krasner Foundation Award; a 1997 Georgia Women in the Visual Arts Honoree National Association for Equal Opportunity in Higher Education; and New York City’s Women’s Caucus Art Lifetime Achievement Award in 2011. This list obviously doesn’t include her 50 first-rank solo and group exhibits. Nor does it include art added to 32 front line public art collections as well as scores of works held in private collections. There’s a lot of culture on hand at GalleryDAAS — running from shotgun shacks and saddlebag houses to community churches — that says a lot of the American experience and the African-American culture that’s emerged from these modest places. This series of ramshackle wooden miniature structures initially may seem slapped together. Yet in truth, these works exhibit an inspired stripping away of superfluous detail until only the essential elements of her creativity remains. But there are also sophisticated flourishes in Buchanan’s art that compound her insightful output. In a way, Buchanan is one of the rarest of all supreme artistic talents: She’s a perpetual beginner. 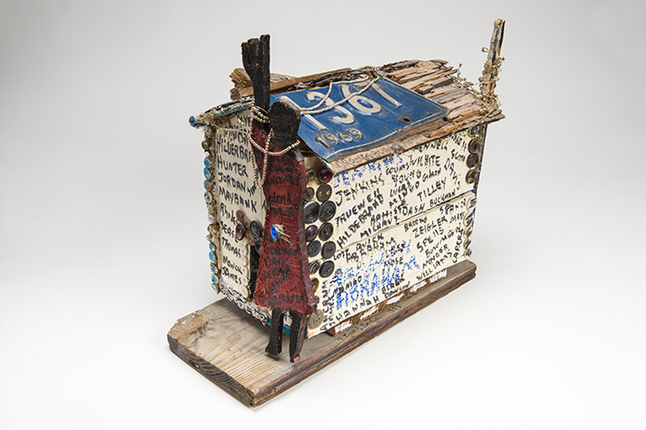 Take, for example, her 1990 wood and mixed-media “Williams Chapel AME Church, Orangeburg, SC” assemblage. Only roughly a foot in its three dimensions, this lacquered architectural marvel manages through its bottle caps, buttons, bottle, ceramic pot, and aged license plate, to tidily create a distinct social identity through these appropriated, incongruous elements; as well as the successive scrawling of names on all sides. Add the sole figurative element in the exhibit — a woman waving to all comers — and this delightfully compact artwork creates a sense of welcoming accentuating the congregation’s generosity. Out of the 16 assemblage in the exhibit (some on freestanding pedestals and others wall-mounted around GalleryDAAS), Buchanan sometimes seems to have the need to stretch herself. 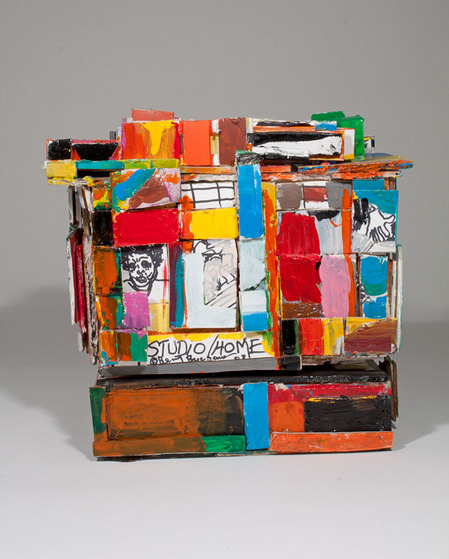 It’s likely not accidental that one of her most accomplished mixed-medias (2008’s foam core and acrylic “Studio/Home”) is a multi-colored cacophony playpen mingling autobiography with chromaticity. “Studio/Home” reflects a rich, gregarious personality. It also reflects someone who shrewdly knows how to grade her palette, even if the appearance itself is riotous. For my part, I believe the raw constructions Buchanan has melded out of patched untreated wood are the most accomplished artworks in the display. In these subtle masterworks, Buchanan uses the grain of her material to create a sense of both character and dimensionality. Throwing together these works would not be easy, because one false move and the entire work is dominated by a single jarring element. Instead, combining components with the precision of a master jeweler, Buchanan pivots each of these unprepossessing sculptures expertly. In particular, her monumental 2010 “Inside-Out” is an astoundingly sophisticated sculpture whose deceptive, casual appearance masks its considerable expertise. With multitudes of raw wood cross-crossing across floors, interiors, and exteriors, Buchanan shows us the geometric logic beneath the work’s haphazard appearance. Reflecting the remarkable bearing of any master working in any art (because this remarkable 29”x21”x17” white and cedar sculpture can be read literally and figuratively on multiple levels), Buchanan has created a complex marvel out what initially appears to be disparate pieces of cobbled wood. What’s needed, Buchanan seems to be saying through “Inside-Out,” is to learn to see anew — again. And this isn’t an easy thing to do. “All in the Family: Improvisational Architecture of Beverly Buchanan” will continue through Feb. 1 at the University of Michigan Department of Afroamerican and African Studies Gallery, G648 Haven Hall, 505 S. State St. Museum hours are 1-5 p.m. Monday-Friday. For information, call 734-764-5513.